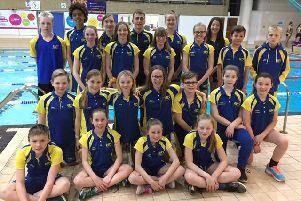 Deepings Swimming Club won 20 medals and smashed four club records at the penultimate weekend of the Lincolnshire County Championships. The club’s tally now sits at 55 (five gold, 26 silver and 24 bronze) with just the 800m and 1500m freestyle events to come this weekend. Medals were won in every stroke by both the girls and boys, a clear display of the club’s current strength in depth and versatility. Alex Sadler set two 12yrs age group club records - first when winning silver in the 50m butterfly in 33.81 and then when again finishing second in the 100m backstroke in 1.17.39. Sadler also won a third silver in the 200m butterfly and completed a fine day of competition with bronze in the 100m freestyle. Deepings’ only gold medallist of the weekend was Louis Metselaar, who won the 17yrs 50m breaststroke title after smashed his own club record when winning his heat in 30.25. He followed that performance with silver in the 50m butterfly, agonisingly missing out on gold by just six-hundredths of a second. Harry Cardell displayed flawless underwater skills to swim to silver in the 15yrs 200m butterfly, more than seven seconds ahead of the third place swimmer. Other boys’ medal winners were Zack Treharne, Tom Adams, Ed Trofimovas and Joe Lund. For the girls Bethany Eagle-Brown continued her impressive recent form in the 100m freestyle, knocking almost a second off her own club record when winning the bronze in 57.99. 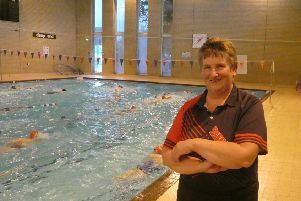 She went one better in the 50m butterfly by winning silver. Deepings won a second medal in the 50m butterfly, with Jessica O’Herlihy taking bronze in the 13yrs age group, while in the 200m event, 11-year-old Lilly Tappern sliced an amazing 22 seconds off her personal best to win silver in a time of 2.53.05. She now sits 32nd in the 12yrs age group British rankings. Completing the medallists at the age group county championships were Emma Dennis (silver and bronze) and Holly Leggott (bronze). 50m butterfly: 12yrs - Alex Sadler, silver; 15yrs - Zack Treharne, bronze; 16/O – Louis Metselaar, silver. 50m breaststroke: 13yrs – Ed Trofimovas, bronze; 15yrs – Joe Lund, bronze; 16/O – Louis Metselaar, gold. 100m freestyle: 12yrs – Alex Sadler, bronze; 15yrs - Zack Treharne, bronze; 16/O - Tom Adams, bronze. 100 backstroke: 12yrs – Alex Sadler, silver. 200m butterfly: 12yrs - Alex Sadler, silver; 15yrs – Harry Cardell, silver; 16/O – Tom Adams, bronze. 50m butterfly: 13yrs - Jessica O’Herlihy, bronze; 16/O – Bethany Eagle-Brown, silver. 50m breaststroke: 10/11yrs – Emma Dennis, silver. 100m freestyle: 10/11yrs – Emma Dennis, bronze; 16/O – Bethany Eagle-Brown, bronze. 100m backstroke: 16/O – Holly Leggott, bronze. 200m butterfly: 12yrs – Lilly Tappern, silver.